It seems we’re working more and resting less these days. This leads to an increased demand for nutrients our bodies need to function adequately. The health-conscious wave has many of us doing everything we can to balance a healthy diet with a busy lifestyle. We turn to the trusty shaker to fuel up when a traditional meal is virtually impossible. Shaker bottles are made with so many various features that you may need help deciding which one to buy. Blender bottles these days range from humble to impressive. There are two features you should make sure your blender bottle has. For one, it should have adequate mixing technology. Because most blender bottles work by manpower alone, the ability to mix liquid and powder should be fairly innovative. I’ve had my share of lumpy protein shakes, and it’s not fun. There’s nothing like consistency when it comes to blending. To increase consistency, shakers should have some form of whisking device. What’s popular now is the wire whisk ball, which you just drop in the bottle. It helps cut through thick ingredients so they blend well with liquids. It’s proven to be a must-have. A second feature you should consider is the bottle’s materials. Although non-plastic materials are less toxic and durable, most bottles are made from good old plastic, unfortunately. There are various unsafe chemicals you might find in plastic. As a general rule, your bottle should be made from BPA-free plastic. Authors Lazúrová and Lazúrová discuss the effects of the synthetic chemicals BPA (a xenoestrogen), phthalates, polychlorinated biphenyls and dioxins in plastics on the human anatomy. They are known to cause obesity, diabetes, cardiovascular diseases, cancers, endocrine disorders, and autoimmune diseases. A lot of attention has been given to the effects of xenoestrogens. They’ve been linked to endocrine disorders and can cause a number of reproductive problems in women. An Environmental Health Perspectives study found that BPA-free plastics may not be exempt from releasing estrogens. Because xenoestrogens are so prevalent, even in other products, such as food, cleaning products, and skin care products, following the steps listed on the National University of Natural Medicine’s website can help you avoid them as much as possible. The National Institute of Environmental Health Sciences does not recommend using plastic containers for anything hot since this can increase the chemicals leaking into your food. It’s better to use stainless steel, glass or porcelain for warm shakes. We searched for a variety of blender bottles. Below you’ll find the top 9. Their features range from basic to quite innovative. This multi-functional bottle provides you with up to 22 oz of capacity. It comes with a wire whisk ball and is leak-free. You might also appreciate that it’s both phthalate and BPA-free. 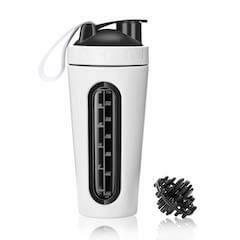 To add, this blender bottle is available in a plethora of colors, is quite affordable and is safe for the top rack of the dishwasher. What seals the deal for some is the inclusion of a pill organizer, making life just a tad bit easier. With a slightly higher price, this blender has some impressive features. First, it’s stainless steel, thus no worries about the toxic chemicals present in plastic. There’s also a transparent window with measurements that allows you to see inside. It’s available in five color options. Furthermore, it’s dishwasher safe and has a leak-proof flip cap. Although the ball and the window aren’t stainless steel, they’re made of a safe plastic called food grade Tritan material. This material is tested to be free of any estrogen activity. 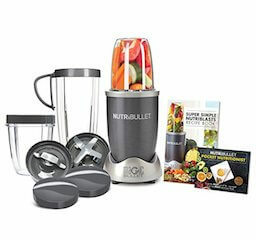 This is a user-friendly, shake-free blender with motor power. Not only can you blend, but it’s useful for grinding foods, such as coffee beans, nuts, and herbs. The motor also comes with overheat protection. It comes with a 12 oz travel bottle that you can simply detach from the base. All materials are made with Tritan material, giving you peace of mind. Priced above the rest, it’s still quite affordable. Finally, the company offers a two-year warranty. 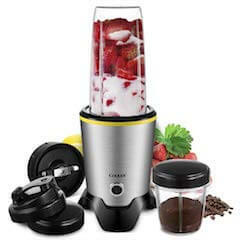 Similar to the Willsence, the CHULUX is a blender and grinder combo. It packs a little more power than the Willsence, thus the higher price tag. The overheat protection technology and Tritan materials are additional features for added safety. 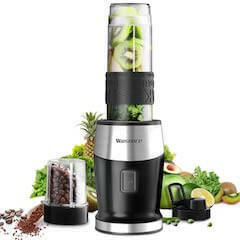 This blender comes with a two-year worry-free warranty. There’s no shaking required with the NutriBullet High-Speed Blender. You can mix pretty much anything, from smoothies to sauces, easily and quickly. The whole package comes with various cup sizes, blades, lids, and a cookbook. The Original Bottle is an affordable mixer that’s simple and effective. It’s made from BPA-free, DEHP-free and food grade materials. Although there’s no whisk ball, it does come with two compartments for storage and a leak-proof lid. You’ll also love the fun neon and gunsmoke black colors. This affordable bottle has vortex technology that prevents clumps. The technology also makes it fast and easy to clean: simply fill the bottle with water and detergent and press the button. It’s powered by a rechargeable lithium battery, so no shaking is required, and it works while in a stable position. The food grade, environmentally-friendly materials are free of BPA and phthalates. 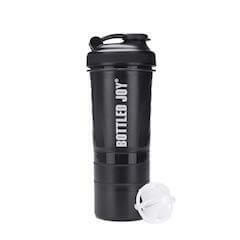 The most affordable bottle on the list, this shaker comes with three detachable layers for storage. Its silicon gasket prevents spills while the plastic mixer ball makes mixing convenient and effective. The plastic materials are phthalate and BPA-free. The Original 2GO keeps it simple with a leak-free design and 27 oz capacity. Included are two nice sized storage compartments. Materials are dishwasher safe, microwave safe and free of BPA and DEHP. Also, you’ll love the plethora of colors from which to choose. 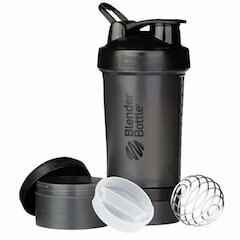 There are some high-quality blender bottles available to fit a variety of needs. All the above are fun and convenient. Be sure to experiment to find the best one (or more) for your lifestyle. 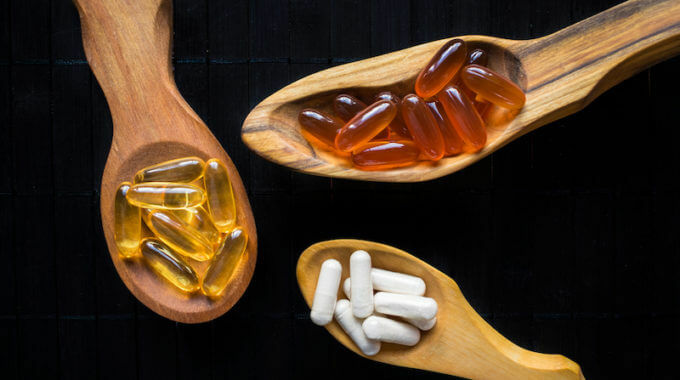 What Are the Best Probiotic Supplements for Men to Buy in 2019? What Is The Best Caffeine Supplement Pills to Buy in 2019? 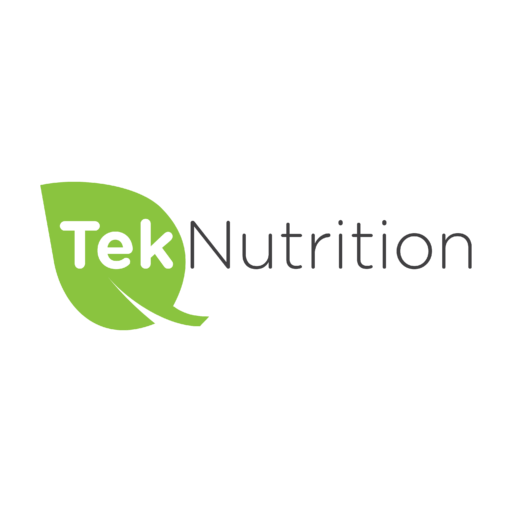 previous post: What Are the Best Iron Supplements to Buy In 2019?